The EU Blue Card Scheme is outlined to make Europe a choice of destination for highly qualified Non-European Union (EU) citizens. 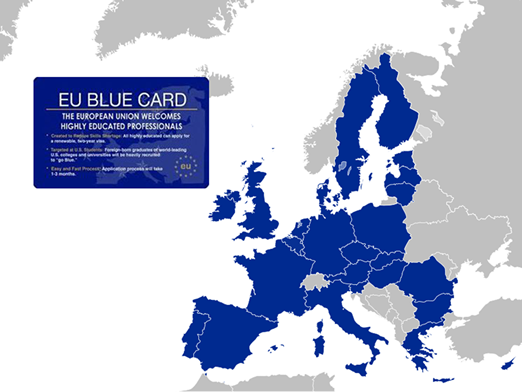 All EU Member States, excluding the United Kingdom, Ireland, and Denmark are participating in the EU Blue Card scheme. EU Blue Card is an immigrant visa that permits the holders to work as well as reside in the EU for an initial period of two years. After a period of five years, EU Blue Card holders can apply for permanent residency. Why apply for EU Blue Card? Who can apply for EU Blue Card? Successful applicants of the EU Blue Card will be able to get a permit to reside and work, enabling them to EU residential and economic rights. They can also bring their family members to the country. Holders of EU Blue Card will have restricted access to the labour market for an initial period of two years after which they can move to another member state for highly-paid work. I have MBA from UK University. I am looking work permit in EU, thanks.